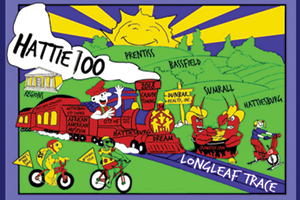 "Hattie Hundred 2019" is a bike ride that offers 100 mile, 88 mile, 65 mile, 30 mile, and a family ride (5 mile) courses on trace as well as a 100 mile off trace ride. Your adventure will begin at the Hattiesburg Train Depot and follow the Long Leaf Trace along a portion of the Mississippi Central Railroad Line. For those who are not familiar with the Long Leaf Trace, it is a paved trail that follows a portion of the abandoned Mississippi Central Railroad line passing through towns such as Hattiesburg, Sumrall, Bassfield, and Prentiss. The 5, 30, 65, 88 and 100 mile on trace rides will remain on the Long Leaf Trace, while the 100 mile off trace will explore county roads in Lamar and Jeff Davis Counties. There is 100-mile ride option that remains on the Long Leaf Trace. There will be 4 rest stops located on the Long Leaf Trace and 2 additional rest stops on the off trace 100-mile route. All 88 and 100 milers must check in at Bassfield Rest Stop on the Long Leaf Trace by 11 a.m. All participants must be finished by 3 p.m.
To register for the ride you can complete the online registration form or mail in a paper registration form to DREAM. Those who complete the 100-mile course will receive a Hattie Hundred 2018 Railroad Spike.